Make your photo manipulations pop with these free lightning Photoshop overlays. 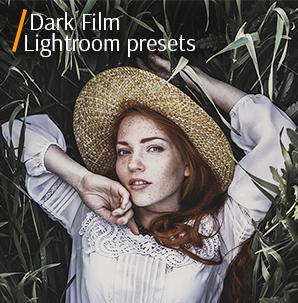 Lightning is difficult to capture, so these photo editing freebies are very helpful and easy to use even for amateur Photoshop users. All plug-ins are presented in different colors, shapes, patterns, and sizes. 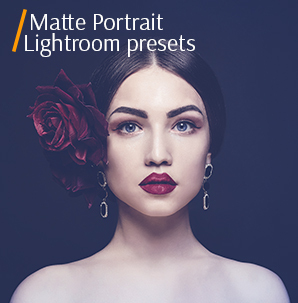 Get beautiful and dramatic pictures without waiting for the lightning to appear. Lightning Photoshop overlays save a lot of time for any landscape photographer. PS Overlay #2 "Strike Effect"
PS Overlay #3 "Rainy Day"
PS Overlay #7 "White Nightmare"
PS Overlay #9 "Screaming Sky"
Ten quality and natural PS overlays created by experienced designers will not only reduce image manipulation time but also help create a unique, beautiful snapshot that you and your viewers will admire. All overlays are very realistic so no one will say that you added lightning during picture editing. 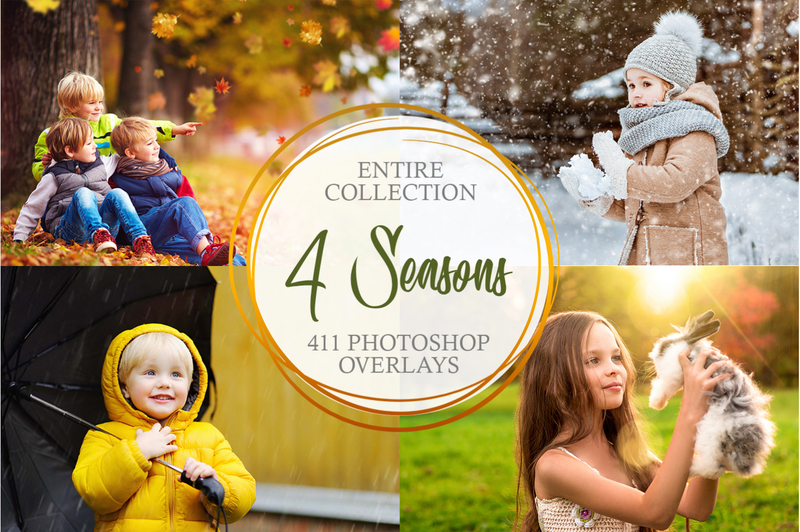 All these Photoshop overlays are suitable for all nature pictures: a summer stormy sky in the mountains, a gray heavy autumn sky or a dramatic portrait photo made somewhere on the beach during the beginning of the rain. These and other images are great to work with Photoshop lightning overlays. Use fantasy to get an excellent result. All recommendations about using these Photoshop overlays are given below. Available for people who use a Mac or PC. They work fine with Raw and JPG images. The photo taken at sunset is perfect for this lightning Photoshop overlay, as thunderstorms and clouds lit by the rays of the sun look great. In addition, the sky will not be too dark and dull. This overlay #1 was taken from "Glittering Lightning"
This lightning overlay Photoshop adds atmospheric mood to the photo, highlighting the dark colors. Highly recommended to use on sea/ocean photos in storm. Lightning Photoshop Overlay #2 "Strike Effect"
Note that all night photos taken on the usual lens have the monotonous background, so we recommend using Photoshop lightning overlays to add drama. This overlay #2 was taken from "Glittering Lightning"
If you want to add a small, slightly visible lighting to the photo, choose this Lightning overlay for Photoshop. For better look, add a smoke as on the example. Free Lightning Overlay #3 "Rainy Day"
We do not recommend using lightning bolts against a cloudy sky since lightning will be almost invisible or look unnatural. This overlay #3 was taken from "Glittering Lightning"
Be very attentive, choosing this lightning overlay as it doesn’t suit every landscape photo. It is great if you want to accentuate the upper part of the photo and create a visual line of the horizon. Lightning Overlay for Photoshop #4 "Storm"
When editing a photo, do not forget that lightning is only the part of the frame. Do not overdo with lightning overlay opacity and size, make it look natural. This overlay #4 was taken from "Glittering Lightning"
This Photoshop lightning overlay is scarcely visible, but you can adjust its opacity as you like. Still, it is recommended to be placed in the middle upper part of the photo. 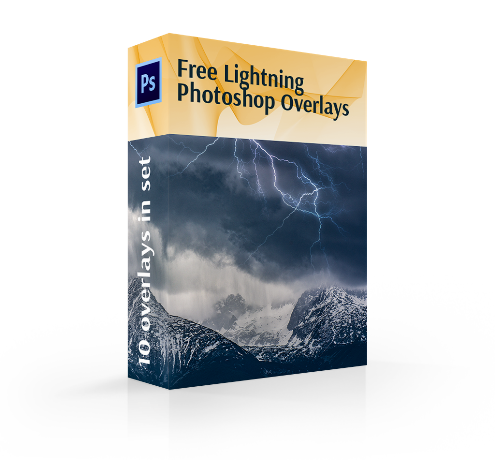 Free Lightning Overlay Ps #5 "Purple"
A photo with any scenery (road, river, beautiful houses, etc.) looks better with this PS overlay. Especially, if the sky is not clouded. This overlay #5 was taken from "Glittering Lightning"
The lighting seems invisible at the first glance, but if you have a closer look, you’ll see how beautifully this overlay outlines the dark sky. Photoshop Lightning Overlay #6 "Mess"
Do not use this technique for the photos where the frame covers a lot of the sky. This overlay #6 was taken from "Glittering Lightning"
This lightning Photoshop overlay are recommended to use for creative photo manipulation. The lightning bolt is very intense, so in such a way you will draw the attention to the upper part of the photo, mainly to the sky. Lightning Overlay Ps Free #7 "White Nightmare"
This overlay #7 was taken from "Glittering Lightning"
This overlay is great for the pictures with smooth cold colors, as it will stand out against the dark blue sky. Lightning Overlay Photoshop #8 "Electric"
You should choose the pictures with large objects to accentuate the power of lightning (house, ship or lonely buildings). Add a sepia or black and white effect for a more dramatic look. This overlay #8 was taken from "Glittering Lightning"
A delightful lightning overlay is applied against the background of large objects. This allows us to show the full scale of the elements. Use this overlay for your Halloween photos. Lightning Effect Overlay #9 "Screaming Sky"
You can use the shadow of a tree, a river, a road or a path not to concentrate all attention to the lightning. This overlay #9 was taken from "Glittering Lightning"
Add this overlay on the background where the white color dominates. It perfectly conveys the atmosphere of a raging storm. Lightning Overlay Free #10 "Energy"
Do not overdo with it’s size and opacity, make it look natural and not stand out. This overlay #10 was taken from "Glittering Lightning"
It allows you to make the photo more atmospheric to convey the mood. As a rule, it is used on the shots, where light colors predominate. 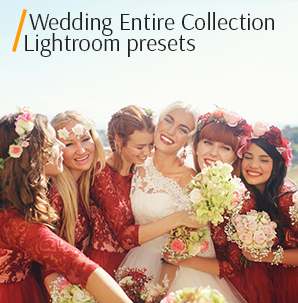 All these lightning overlays will make your photo manipulation work quick and comfortable. They can make each of your photos special, moody, and dramatic in several clicks. Add them to your Photoshop plug-ins collection and create masterpieces with lightning overlays for Photoshop right now.